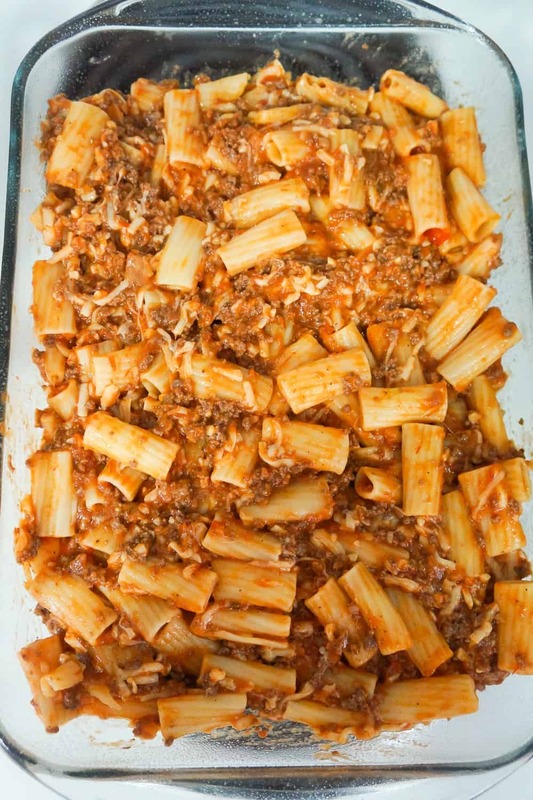 Baked Rigatoni Bolognese is an easy pasta dinner recipe loaded with cheese. 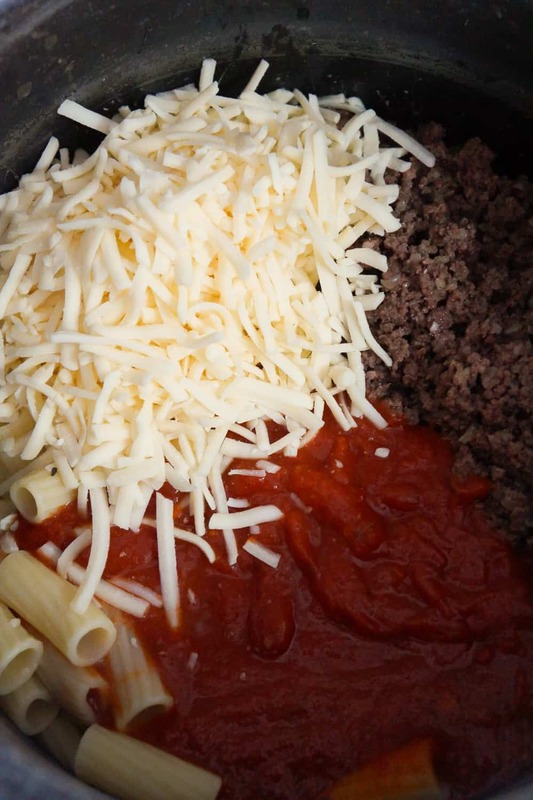 This pasta with ground beef and marinara sauce, is topped with Mozzarella and Parmesan cheese. 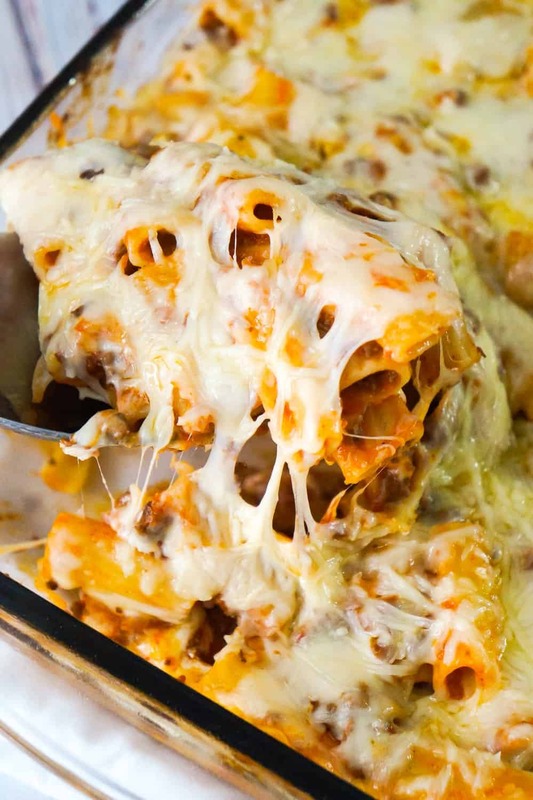 To make this baked pasta, I started by boiling some rigatoni noodles, draining them and then returning them to the empty cooking pot. While the noodles were cooking, I browned some ground beef in a large frying pan. Once the beef was fully cooked I added it to the pot with the noodles. I also added some marinara sauce and shredded mozzarella cheese to the pot. I dumped the pasta into a greased 9 x 13 inch baking dish and spread it out evenly. Then I sprinkled some shredded Mozzarella and Parmesan on top. I baked the pasta until the cheese was fully melted and just starting to brown around the edges. 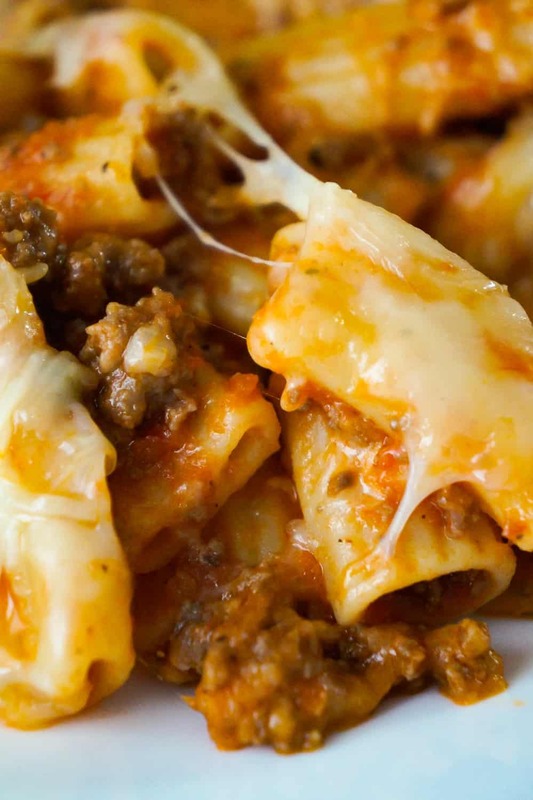 This cheesy rigatoni loaded with ground beef is a hearty meal perfect for cold weather. 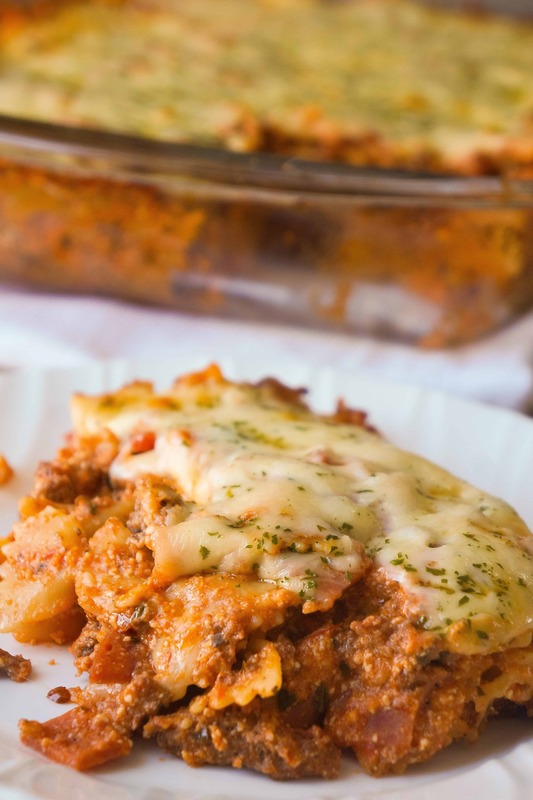 If you are looking for an easy and delicious dinner idea be sure to try this Baked Rigatoni Bolognese! 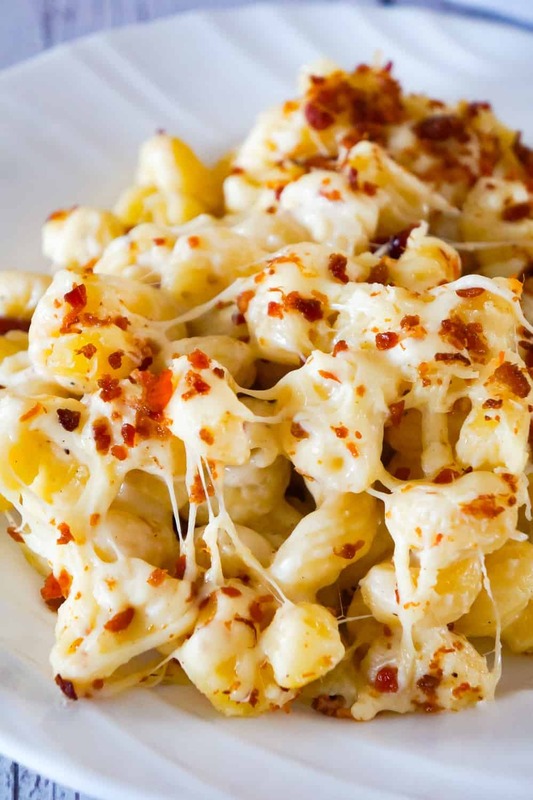 Another delicious pasta recipe. 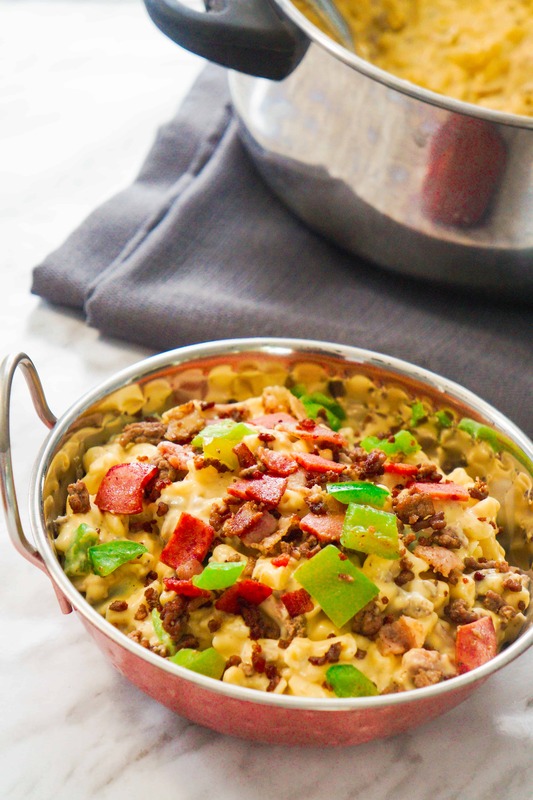 Check out this Meat Lover’s Mac and Cheese! 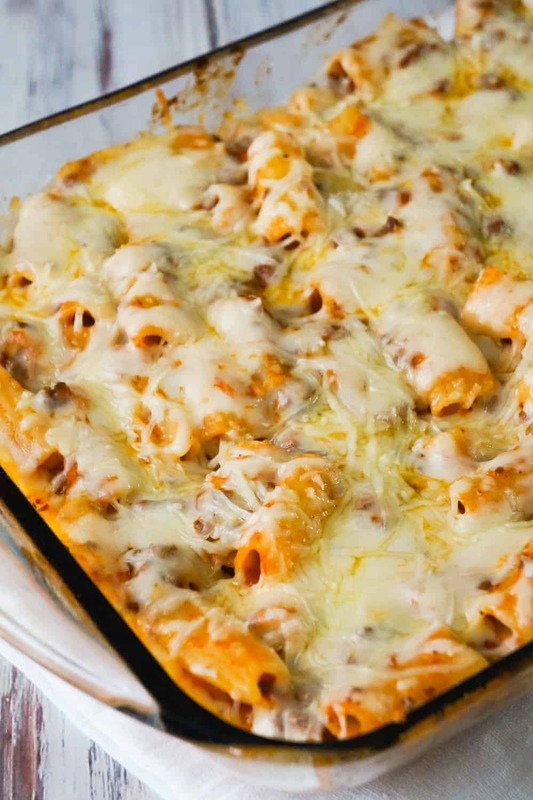 Another easy baked pasta recipe. 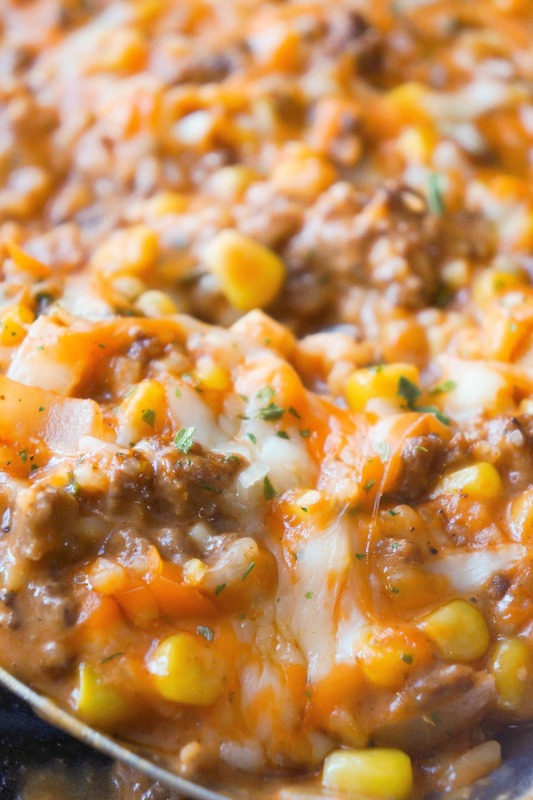 Check out this Three Meat Lasagna Casserole! 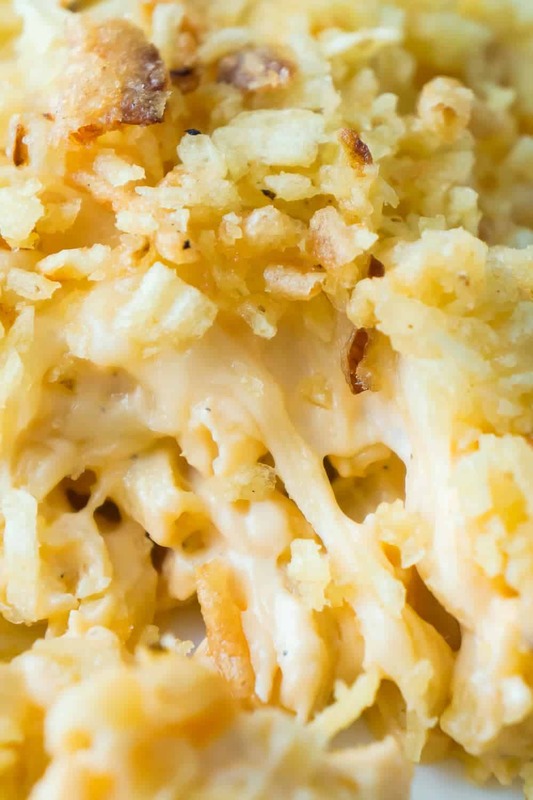 Be sure to also check out this Baked Mac and Cheese with Potato Chip Topping! 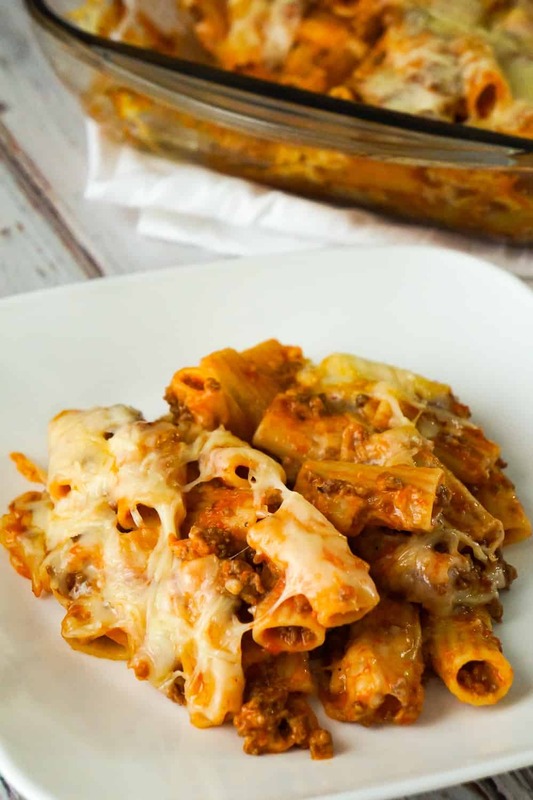 Baked Rigatoni Bolognese is an easy pasta dinner recipe loaded with cheese. 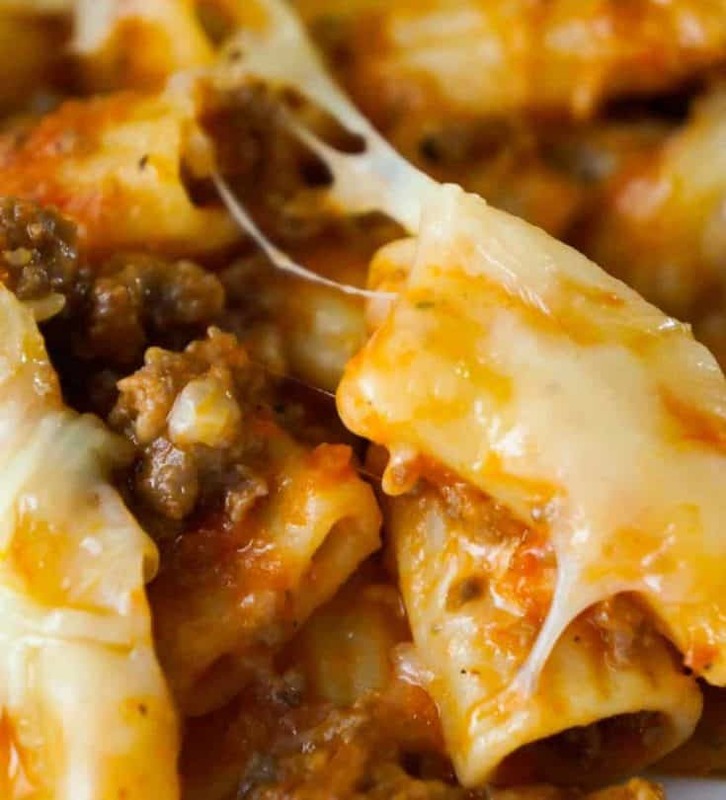 This pasta with ground beef and marinara sauce, is topped with Mozzarella and Parmesan cheese. 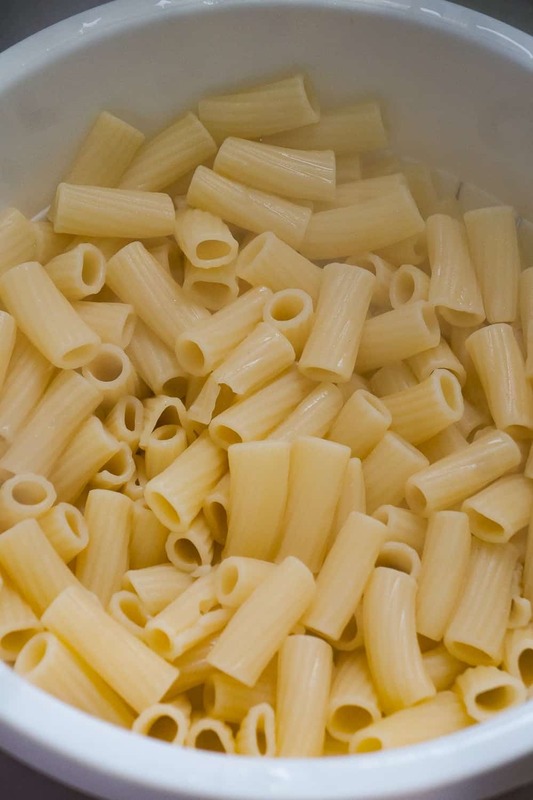 Cook rigatoni noodles according to the directions on the package. Drain and return the cooked noodles to the empty cooking pot. While the pasta is cooking, brown the ground beef in a frying pan over medium-high heat, with a dab of butter or margarine. Add the dehydrated minced onion, salt and pepper to the ground beef as it's cooking. 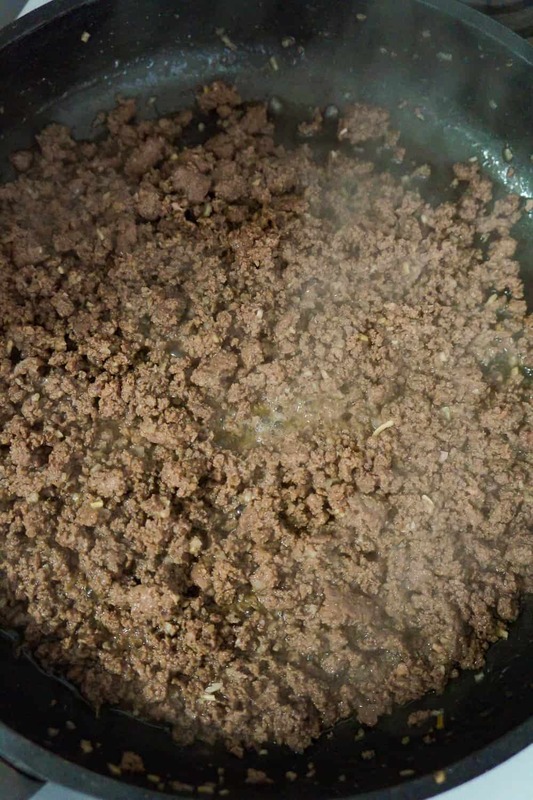 Once the ground beef is fully cooked, dump it into the pot with the pasta. Add the marinara sauce and 2 cups of the mozzarella to the pasta pot as well. 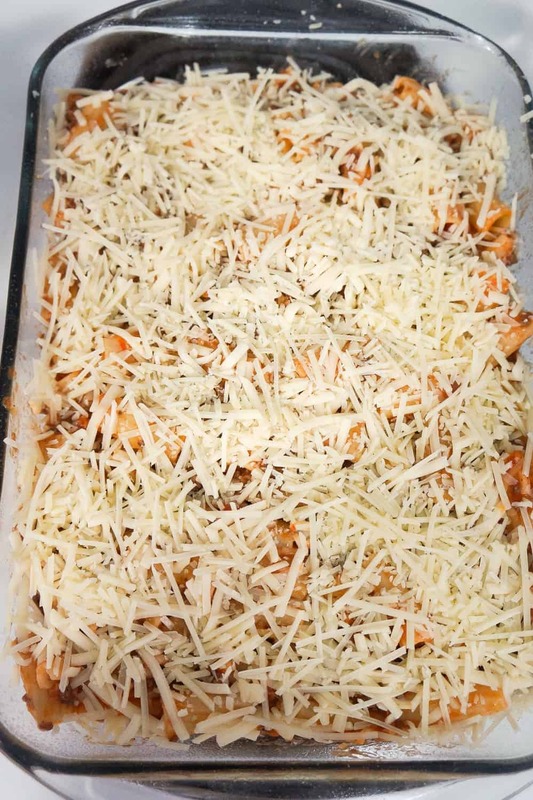 Stir all of the ingredients together really well and then dump the pasta into a greased 9 x 13 inch baking dish. Spread it out evenly. 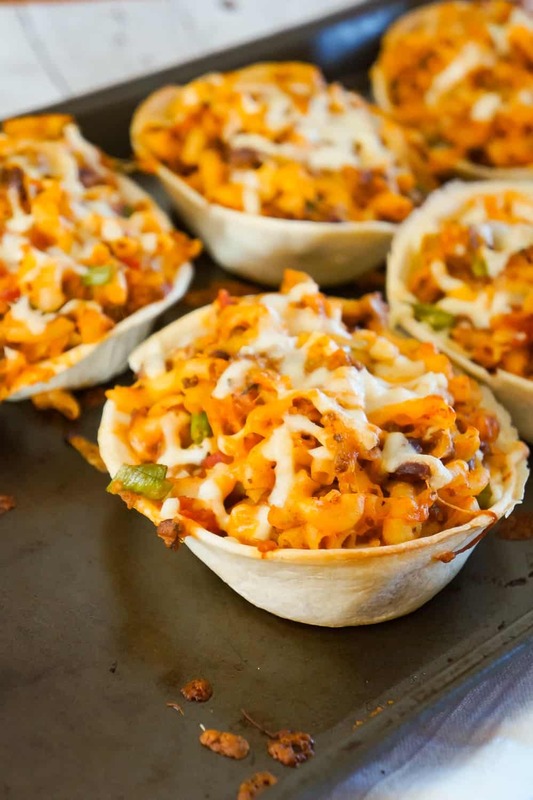 Sprinkle the remaining cup of mozzarella cheese on top as well as the Parmesan cheese. Place the dish in the oven and bake until the cheese is completely melted and just starting to brown around the edges of the pan. 16-18 minutes.